Have you ever tried to remember what books you've read or want to read and forgotten most of them? Ever bought a book, brought it home excited to read it only to find that you'd already read it? We can help. 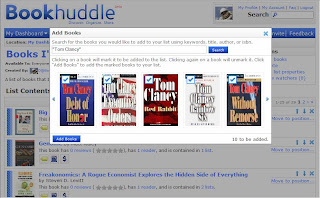 Bookhuddle is a book-focused social networking and book reference site created to help you discover, organize, and share books. In this post we'll show you how to organize your personal library with Bookhuddle. We'll focus on a simple tool that helps you track your books and reading: lists. A related tool is tagging, which will be covered in another blog post. When you sign up, five lists are created to help you start tracking your books as soon as you begin using Bookhuddle (corresponding to items 1-5 mentioned above). You can also create as many book lists as you want to help you better categorize your books. To create a list, click on the drop-down arrow next to the "Lists" item in the top navigation and select the "Create a List" option. Enter a name and an optional description and click "submit". The list will be created and you will be taken to the detailed view of the list where you can start adding books. Choose whether you want to add the book to an existing personal list, a new list, or a list in one of the groups you're involved in. Click the submit button. The book is now in your list! You can add the same book to more than one list. For example, if you have read, own, and consider this book one of your favorites, you can add it to all three lists. The detailed view of a list provides a very fast and convenient way of searching and adding books. Click on the "Add books" link, search for the books that interest you, and add them to your list. For example, if you are a big Tom Clancy fan and want to add his books to the books you have read, simply access your "Books I've read" list, click on the "Add books" link and search for "Tom Clancy". You can select all the books returned in the search results and add them to the list. To remove a book from a book list, go to the detailed view of the list and click on the "X" icon next to the book. For your convenience, you can always see your lists in your Dashboard or on the Lists area of the site. We are the team that created and operates Bookhuddle (www.bookhuddle.com), the book-focused social-networking and book reference site created to help people discover, organize, and share book information.